Spring is sprung, the grass is riz – and our members have a plentiful supply of new releases to keep you reading and happy this September. Enjoy! Congratulations to all our members who have a new book out this March. There’s a fabulous selection of historical and contemporary romances across a variety of sub genres so if you’re looking for a new read, this is the place to start! It’s conference month but even amidst all the bling, chatter and learning, a girl must have a book to read. Try one of these new titles from our members. The last two days in Sydney have seen a distinct drop in temperature from lovely mild autumn to ‘nippy-with-rots-in-the-garden’. It’s definitely time to pull out the winter sheets, switch on the heaters and huddle under your doona with a hot water bottle. And a book, of course. Without a good book, you’ll never be able to forget it is cold out there. Luckily, our members have obliged with a host of fabulous new books. Enjoy! The cooler temperatures of Autumn have finally arrived – better late than never. If you’re looking for a new book to curl up with indoors to enjoy a bit of ‘me time’, there’s no better place to start than with this month’s new releases from our members. There are so many I have been looking forward to across several sub genres. In historical romance, there is The Wife’s Tale by Christine Wells (who also rights under Christina Brooke), The Master of Strathburne by Amy Rose Bennett and Shrouded Passions by new-to-me author Faye Hall. 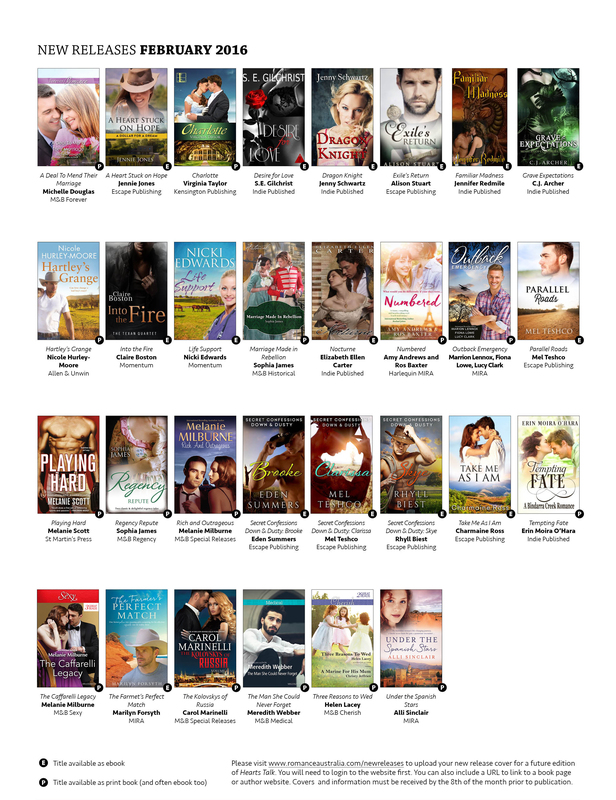 There’s also a new sci-fi from Valerie Parv, Earthbound, new rural romances from Trish Morey, Kerrie Paterson and Jenn McLeod, romantic suspense and a feast of contemporary romance titles covering everything and everyone from female jockeys to rock stars, doctors, cowboys and highlanders. Is there a particular new release that has your finger depressing the one-click button? Can you believe that it is March already? What happened to January and February?! hope you got some reading in before the days vanished. If you’re looking for something new to read, try one of these new releases from our members. There are some great titles on offer.